Watch leading chordoma experts and chordoma community members answer important questions about chordoma in our Expert Answers Series of videos. What should I do? If you or someone you know has chordoma, you’ve probably found yourself asking this question. It’s an important question to ask because, when it comes to treating chordoma, what you do — or don’t do — can have a major impact on your life. We developed the following educational materials to help you make informed medical decisions and get the best care possible for yourself or your loved one. To download or request hard copies of these materials, please use the form at the end of the page. 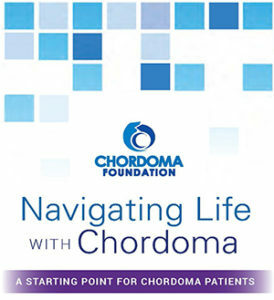 If you have any questions as you read through this information, please request help and a Chordoma Foundation Patient Navigator will gladly assist you. The brochure is a useful overview of the various services the Foundation has available to patients and provides information on how to connect with us to learn more. We hope the information in the brochure will help you connect with our resources and the chordoma community. Please complete the form below to download a PDF of the brochure in English. The Chordoma Global Consensus Group is a multidisciplinary, international group of more than 60 doctors who specialize in caring for chordoma patients. 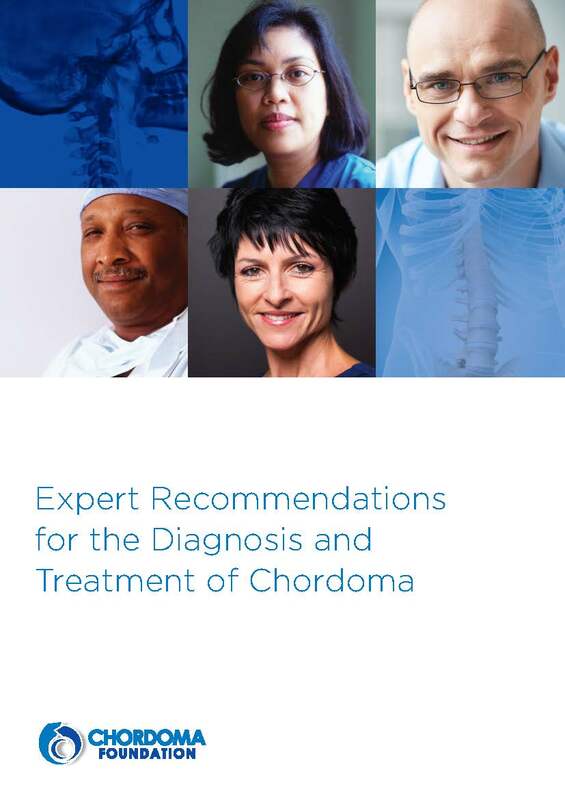 The Chordoma Foundation and the European Society for Medical Oncology brought this group together to define evidence-based recommendations for medical professionals on the best ways to manage chordoma. 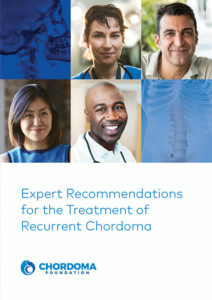 As part of our commitment to helping chordoma patients and caregivers make the most informed treatment decisions, we have made the recommendations of the consensus group available to you in our Expert Recommendations booklets. The consensus group first met in December 2013 and developed guidelines for medical professionals on the diagnosis and treatment of primary chordomas, as well as chordoma tumors that are advanced or metastatic. The resulting recommendations were published in 2015 in the clinical oncology research journal, The Lancet Oncology. These recommendations are available to you in the first booklet in our Expert Recommendations series. In this booklet, you will find information about how chordoma is diagnosed and tests to get before treatment. You will also learn about best practices for treatment of a new diagnosis, what to expect after treatment, as well as general guidance on advanced or metastatic disease. We hope this resource provides you with knowledge that will help you make informed decisions about your care. Please complete the form below to download a PDF of the booklet in English, Chinese (Mandarin), Dutch, Italian, Japanese, or Spanish. You may also request a hard copy by mail (English and Spanish only). The consensus group came together again in November 2015 to develop detailed recommendations for treating locally and regionally recurrent chordoma – a complex topic which required in-depth discussion and careful analysis of available evidence. The resulting guidelines were published in an open-access paper in the high-profile medical journal, Annals of Oncology, in June 2017. We developed the second booklet in our Expert Recommendations series to make these recommendations available to you. It is intended to answer questions about what to do if your tumor returns and how to get the best care possible. 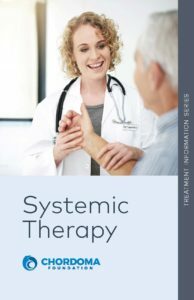 Individuals who have been treated for chordoma in the past and are now experiencing a recurrence (tumor regrowth) will benefit most from this comprehensive booklet. 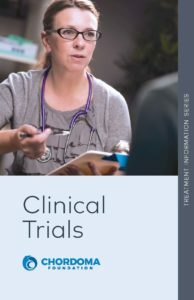 Helping to illustrate the treatment guidelines throughout the booklet are a series of flowcharts which walk you through the suggested tests, treatment options, and follow-up steps recommended for different recurrence scenarios. Please complete the form below to download a PDF of the booklet in English. You may also request a hard copy by mail (English only). Translations will be available in 2019. Please complete the form below to download a PDF of one of our educational resources or request hard copies (of select materials) be sent to you by mail. What is your relationship to chordoma? Which resources would you like to receive a hardcopy of? How did you first learn about the Chordoma Foundation? Please select one of the following. Would you like us to contact you with relevant updates such as our e-newsletter, progress updates, the latest research and treatment advances, educational resources and events, and opportunities to get involved? Chordoma Foundation educational materials are for informational and educational purposes only. They are not a substitute for professional medical advice, diagnosis, or treatment. All care and treatment decisions should be made in consultation with a physician or other qualified health care professionals who are familiar with your specific health situation. Always seek the advice of your physician for any questions you may have regarding your medical care. Never disregard professional medical advice or delay in seeking it because of something you hear in a video or read on this website.